Happy Sunday to you!! Today for #SundaySupper we had to make a dish that was free of everything! Meaning it should or could be gluten-free, vegetarian, sugar-free ect… So today I thought I would share with you a simple, refreshing summer soup that fits all categories and that is perfect to accompany any meal! This is my Cantaloupe Strawberry and Coconut Gazpacho. I decided on this recipe because I got two little cantaloupes in my CSA box last week, and they were standing on their last legs. I knew I needed to make something with them and fast! I wasn’t sure exactly what I was going to do with them, but I thought originally making a cantaloupe soda, so I processed my cantaloupe in the blender and it turned into a wonderful thick liquid in a matter of seconds. This was one sweet and fresh cantaloupe. I took a sip and thought, hmmmmm I bet strawberries would be good in here. In went the strawberries. Once I took one more taste, I thought that this is so thick it would make a wonderful summer soup. So the idea of gazpacho was born. Since my Husband doesn’t like seeds from strawberries, I decided to strain the seeds from the fruit. It made it all that much creamier, but the only thing about doing this, is I lost about 1/2 cup of my mixture. To make up the difference for lost fruit, I added some coconut milk to it, which made it creamier and while I was at it, I added a pinch of coconut extract. Amazing! I would have never of thought of coconut and cantaloupe together, but it is pretty darn good! This little soup is perfect for a hot summers day, plus it makes for great use of melon that needs to be used. Not only is this dish healthy, full of vitamins and nutrients, but it is also gluten-free, vegan and sugar-free! The only sugar in this dish is the natural sugar from the fruit! So grab a spoon and enjoy!! 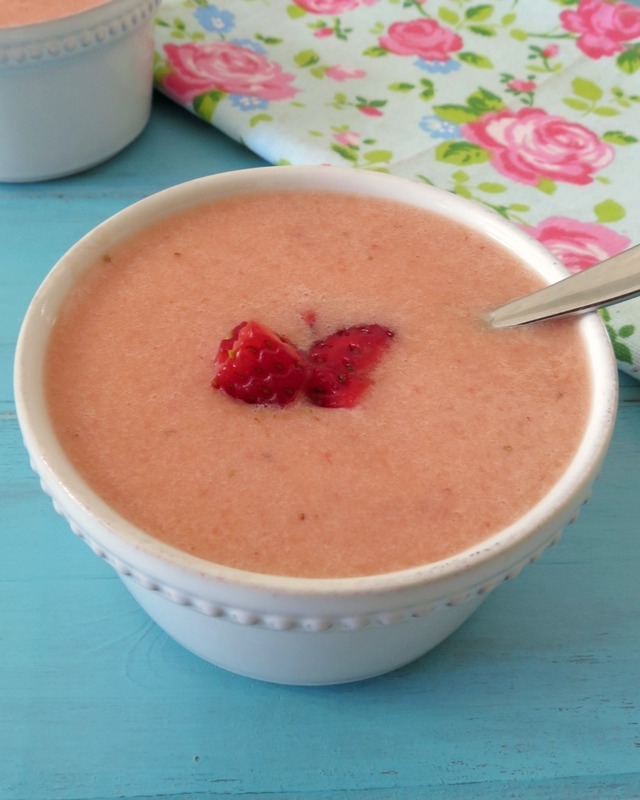 A sweet creamy cold soup made with cantaloupe, strawberries and coconut. In a blender add cantaloupe and strawberries. Process until smooth. Add stevia or sugar to taste. Place a fine mesh sieve or line a bowl with cheesecloth and pour the fruit into sieve. With a back of a spoon, push the fruit through. You want to get rid of the seeds and pulp. Discard the pulp and seeds and place your mixture in a bowl. Stir in coconut milk. Taste one more time to see if additional sugar is needed. Refrigerate until cold, serve within one day. You can freeze it make like a smoothie,if your not going to use right away. I just love summer produce! Nothing beats it!!! Now be sure to check out what the others brought to the table for #SundaySupper. Be sure to come back on Sunday for all the amazing “Free For All” recipes! We would love to have you join our Twitter #SundaySupper chat party starting at 7:00 pm EST. Follow the #SundaySupper hashtag throughout the day to see the amazing recipes. We look forward to see you to join all you need to do is follow[ the #SundaySupper hashtag and please do not forget to include the hashtag in your tweets as well. Be sure to check out our #SundaySupper Pinterest board for more delicious recipes and photos. This gazpacho looks so delicious and refreshing for the hot weather we are having. I don’t use cantaloupes nearly enough as I should in recipes-looking forward to trying this! Hi Laura! I don’t use cantaloupes nearly enough myself. I seem to buy them, and never use them. Then I either toss them because I forget about them or freeze them. They are awesome frozen!! 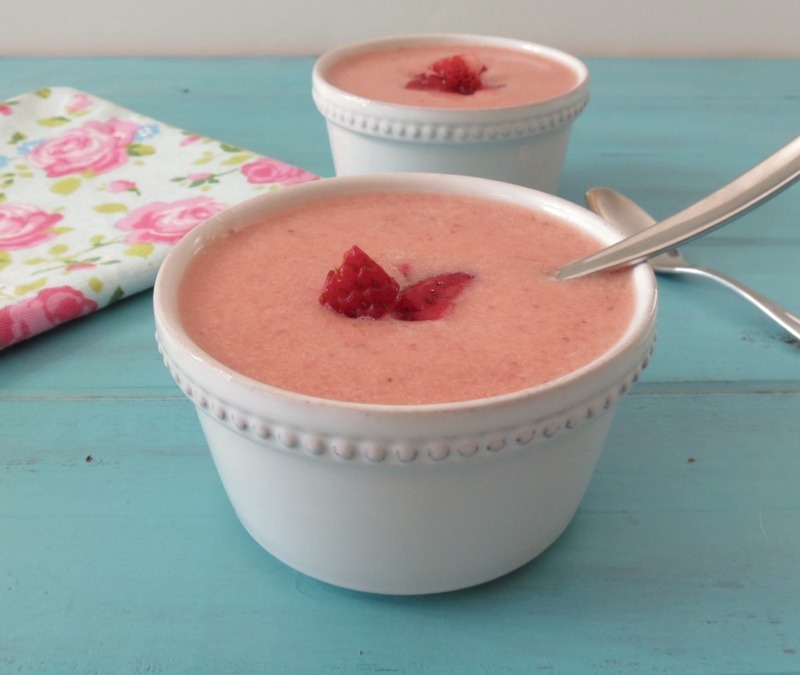 I make a strawberry soup, and you’ve opened my world to all kinds of opportunities! WOW! Yum…I can’t wait to make this next time I pick up a pretty cantaloupe at the farmers market. BTW…I had a cat named Spot who went NUTS for cantaloupe! He could be at the back of the house, and he’d know when we were cutting one up…he’d come running, meowing the entire way. Yum! What a perfect dish for a hot summer day. What a perfectly fresh, beautiful and delicious looking dessert! Isn’t it fun to see creativity at work while making recipes? It turned out lovely! How creative! I always wonder what to do with the extra cantaloupe because when I find those perfect ripe sweet ones at the market I buy way too many for the two of us. Lovely first course to start out a summer meal. Gazpacho is, hands down, my favorite cold soup. A dessert one with summer fruits is a brilliant twist Jennifer! I love cantaloupe, just need to get them perfectly ripe and sweet. I have to say these were two almost over ripe melons, but they were so sweet and perfect for this kind of soup!! LOVE this, I hate gazpacho normally but fruit soup? Yes please! Hi Jennifer! Very glad I found your blog tonight 🙂 I love the thought of this cool and refreshing soup. Strawberries and coconut will always be a favorite flavor combination of mine! Thank you for sharing! Ahhhm thanks Monet! I love strawberries and coconut together, such a wonderful combination! Excellent recipe. It’s strawberry season in full swing here in NorCal. I once had an heirloom melon soup with creme fraiche in Calistoga one time and I’ll never forget how refreshing it was. Blend on! That soup sounds amazing!! I can only imagine how wonderful it must taste with creme fraiche. I wonder if I can pass this of as “Princess soup” to my daughter! 🙂 It’s beautiful! Amazing is the exact adjective for your gazpacho, Jennifer. 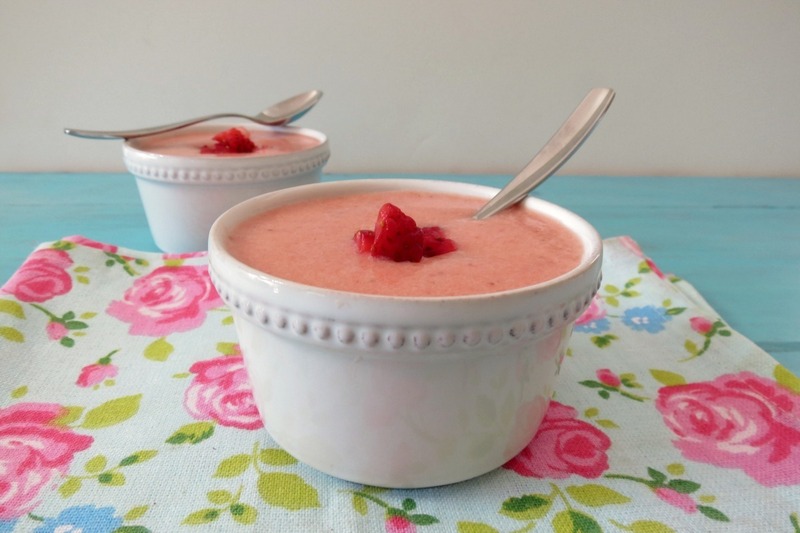 The photos are so very pretty in pink and you can almost taste the sweet creamy soup. Lovely! What a lovely soup! Gorgeous color! Yum! I totally should be making more cold soups. I need to too! I don’t make enough cold soups and I love them! Ooh I love these fruits with the coconut milk! 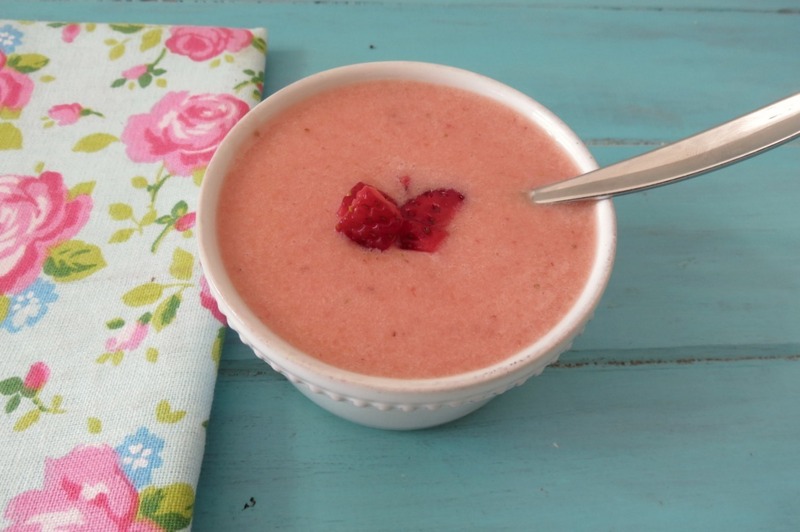 !The perfect chilled soup for the summer and so so delicious!! Awesome cold soup, I just wished you would have posted it earlier. Summer is kind of over here so I ll have to wait until I can make your fruity gazpacho. Ahhhh, summer’s almost over. Ours is kind of beginning! We get one hot day, one cold day! It’s crazy!! 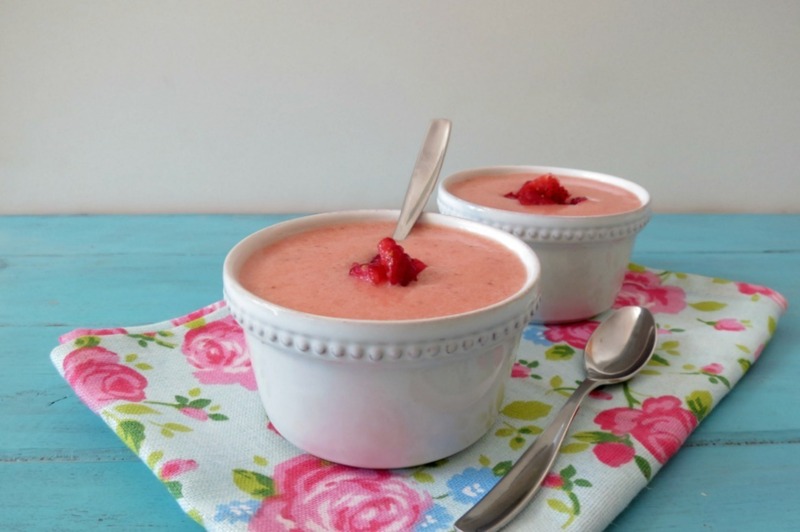 I love cold soups, and this gazpacho would be a perfect summertime dessert. Love the color also! Thank you Isabel! I love the color too!! OMG ! This looks so good !!!! I have to try this. am a huge fan of coconut milk so this is a big win with me. Sounds so refreshing !! Yumm ! Thanks Sunithi! I am a huge fan of coconut milk! I love it and it adds so much to recipes. I’m so into soup lately and this sounds so refreshing, light, and healthy! Love the bright color too. I love that you added a touch of coconut to your lovely fruity soup! Beautiful!!! Ahhh, thank you Liz! I kind of have a thing for coconut! 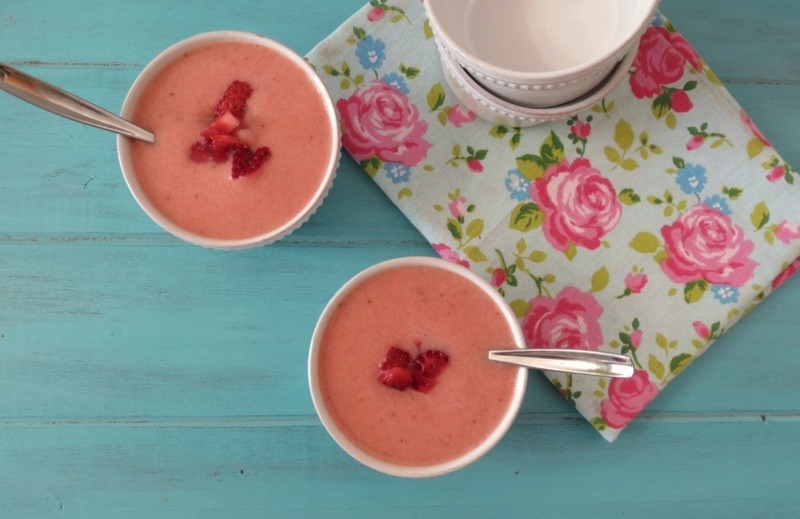 I never thought of making a fruit gazpacho but this looks gorgeous! I would never have thought of coconut and cantaloupe together either, but this sounds like a perfect dessert – or breakfast – to me! Oh yum, yum, yum. Cantaloupes are finally in season so I can’t wait to give this a try. Hi Laura! If you try it, let me know what you think! Wow, your Mom’s soup sounds amazing! I love the idea of using papaya and the chunks is so perfect! I think this would make a good Popsicle!! I woudl say, give a try! I bet it will turn out great! Beautiful color Jen. Sounds so refreshing! Hey Jennifer – do you think this would freeze ok for later use? Looks amazing! Sorry for the late reply Janna! I think it would work out great! Just take t out of the freezer a couple hours before serving. If it’s still hard, I’d throw it in a blender to break it up.